This August 13, Geneva dazzled us with fireworks. We watched them with our windows grandly open, huddling ourselves to listen to an opening Indian tune, followed by Opera. 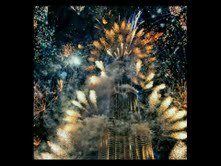 The most spectacular fireworks I have seen yet, the most memorable ones yet, were viewed from the 10th floor of a very hospitable family, at the launching of Burj Dubai. The couple threw the party of the decade and they outshone any Salle des Lumieres' wedding fireworks. 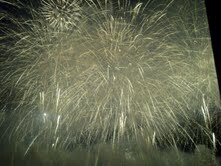 The fireworks in Geneva are nice but they aren't as extraordinary as the fireworks I saw that night. Burj Dubai was ablaze with light and celebration. An unforgetable night. This family of six is very festive. But they have somehow arranged things in such a way that they celebrate their birthdays by pairs and therefore only have three celebrations a year for a family of six. The first clue is that they have four boys, paired as two sets of twins. That makes for two birthdays. The third birthday is their own, and we aren't talking wedding anniversary here: they are born on the same day: today September 10! Happy Birthday to the set of twins and mashallah for the father who times well. Monaco is a fun city in summer,that gets transformed into a city Principality for financial refugees.It had seen the Czarist Russians at the turn of the 20th C and is witnessing their return at the turn of the 21st C. In between it witnessed the flow of rich Europeans and Arabs,but nothing compares to the return of the Russians with vengeance . The Principality celebrates fireworks competitions during July-August,and has a short show after each gala of the Salle DES Etoiles.This year was special in honor of the Royal Marriage in July where the middle aged Prince Albert married the South African blond swimmer.One thing to remember is that the celebration went on without a hitch despite the heavy atmosphere about the rumors that the marriage was going to be cancelled the last minute.